10 Easy Steps to Clean Marine BC marina certification! Allow us to walk you through the 10 easy steps to Clean Marine BC certification, and get the recognition you’ve earned for your environmental best practices. Westport Marina, the first to fly the Clean Marine BC flag! This extensive and informative manual is a valuable resource of Environmental Best Practices for all marinas, yacht clubs, boat yards, and other boating facilities. We encourage you to get a copy for just $35.00, whether or not you wish to proceed with Clean Marine BC certification. Contact cmbc@georgiastrait.org or call 250-753-3459. If the Clean Marine BC policy is something that you and your employees can commit to, go to step 3. Step 3: Enroll in the Clean Marine BC Program! This program only costs $120.00 to join and gives you access to the consultative support services of Georgia Strait Alliance’s award winning Clean Marine BC team. Enrolment also gives you access to the Clean Marine BC email list serve which allows marina operators and owners, and our Clean Marine BC team, to network and share information. Display the signed Clean Marine BC Policy in your front office (and other applicable areas) and return a copy to Georgia Strait Alliance. Consulting Appendix “F” in the handbook allows you to quickly and easily assess your facility in terms of Environmental Best Practices and assist you in determining what improvements you need to make to become eco-rated. This part is totally dependent on your facility, your budget, your commitment and possibly your community. It may range from doing nothing if you’re already following best practices, to putting up some signs, to doing some major renovations. When you think you and your facility are ready, you can apply to Georgia Strait Alliance to be audited by an independent auditor. Step 8: Go through the Clean Marine BC audit process – don’t let the word ‘audit’ deter you! The audit process is in two parts. First, the auditor will send you a comprehensive checklist of Environmental Best Practices (similar to the Self Assessment Program but slightly more detailed). You complete this checklist and return it to the auditor. The auditor will then conduct an on-site verification visit when they are next in your region. This process normally takes 2-3 hours. They will assign an eco-rating between 1 and 5 anchors based on the checklist and site verification – with 5 being the highest level. The auditor writes a full report on your facility, highlighting areas of excellence and providing information on areas that need further work, allowing room for continual improvement. Current cost for this service (steps 8 & 9) is $700.00 plus travel time and expenses. Whenever possible we will combine audits with nearby facilities to reduce this cost. See our Clean Marine BC program benefits for possible assistance with fees. Step 10: Clean Marine BC certification awarded! 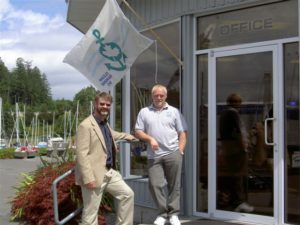 Georgia Strait Alliance awards your marina with an eco-rating certificate and a Clean Marine BC flag. You are now eligible to market your facility with Clean Marine BC graphics and signage. Your facility will be promoted as a Clean Marine BC certified facility, which includes a listing on our website, and promotion at boat shows, in boating magazines, social media, press releases, presentations and conferences, Georgia Strait Alliance newsletters and more!